With this post, I begin a month-long celebration of journeys and books. Each post will focus on a particular journey and the book that either took me or came along for the ride. Because this month also encompasses my birthday, always a milestone in life’s journey, I want to celebrate by sharing the books I mention here. Each post will come with an invitation to leave your own thoughts and, by doing so, enter a drawing to win a copy of the book or books in that post. It’s a way of saying thank you for the wonderful welcome during my first six months of blogging here. I’ve learned so much and look forward to learning more. Let me hear from you! Happy travels and happy reading. Congratulations to Camille at Wine and History Visited who won the drawing for “State by State, a Panoramic Portrait of America.” Next post: Stranger in a Strange Land by Robert A. Heinlein! 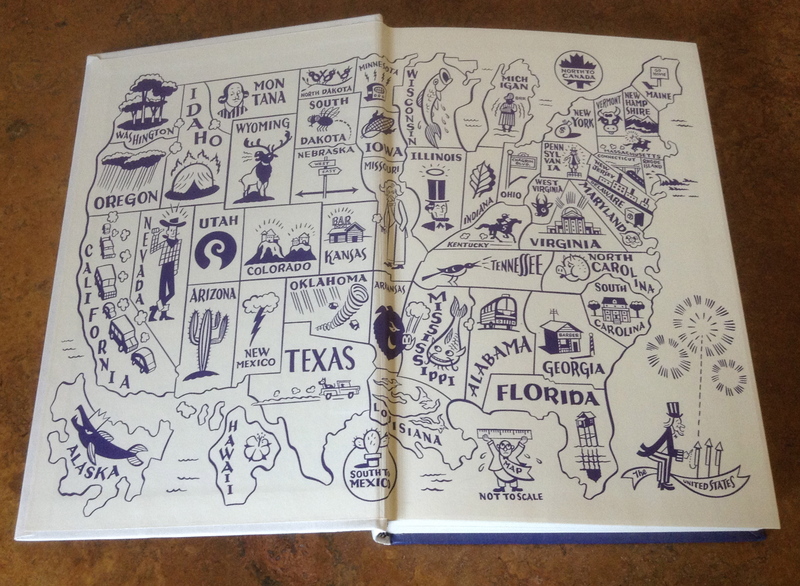 I was late to discover the book, State by State, a Panoramic Portrait of America. It was published in 2009 but it turns out that it came to me at the perfect moment, the way the best books always do. It took me a little while to realize just why the red, white, and blue volume beckoned to me from the “Librarian Picks” shelf at the local library. Then it hit me. It’s July, the anniversary month of my first road trip ever. Thirty nine years ago this month, my barely-younger brother (we are the same age for three days which makes us Irish twins), and I wedged ourselves into my mother’s green Pinto station wagon, drove down the dirt driveway to US Route 2 and turned right. We came back six weeks later. In between, we saw 18 states and 5 Canadian provinces, celebrated my 18th birthday and his 17th with our first legally-purchased beer in Denver, and never thought about the world the same way again. Lots happened on that trip that we wished hadn’t. Lots didn’t happen that we wished had. In other words, it unfolded the way most journeys do. It challenged us. It drained us. It thrilled us. It left us wanting more. My brother went back on the road a year later and began a series of trips that took him to every state but Alaska by the time he turned 26. It took me longer. Nevertheless, that first road trip became a reference point for all future trips. Once, I found myself driving a rented car from Oakland to Sacramento for work and as I motored through orchards and past acres of green leafy things, I was seized by the freedom that comes with being alone in a car, in a new place, in motion. I was single then, my son was already launched on his own journey and lived two thousand miles from where I’d raised him. The sense of discovery born on that first trip with my brother came back to me and I stopped the car near a town, found a phone booth (yes, a phone booth) and called him at work. He laughed. In the background I could hear the sounds of machines shaping the wood that he and his crew made into furniture. In his laugh, I heard the “no” already forming. He was a dad now. He was working with my father to build the furniture business. He couldn’t just pick up and go. The moment passed but a new realization lingered. Once a journey is over, it can be recalled, never re-lived. Still, echoes of that first trip and all those I’ve taken since grew louder in my ears as I read each of the fifty essays in State by State. 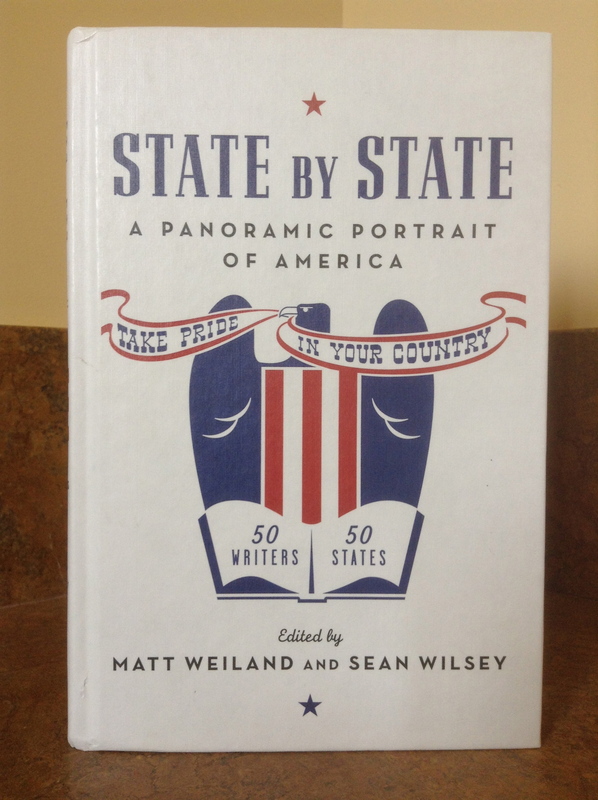 Although inspired by the Federal Writers’ Project state guides, editors Matt Weiland and Sean Wilsey, did not set out to recreate them. Instead they asked “a mix of novelists, reporters, cartoonists, a cook, a playwright, a filmmaker, and a musician” to show us around. Jonathan Franzen “interviews” the state of New York, Ha Jin paints a portrait of the Georgia town where he bought his first house and started his family. Dave Eggers gives us all the reasons that Illinois is the best state out of the fifty, and John Hodgman earnestly explains the importance of being Massachusetts. Some of the writers write as native sons or daughters, others as outsiders. In every case, the perspective is personal and piercing, and, as in Franzen’s interview and Hodgman’s essays, sometimes laugh-out-loud funny. The pieces also struck old chords for me. Heidi Julavits opens her piece on Maine with, “By the time this essay is published, I will already be in hiding…” She understands that calling herself a “Mainer” requires a string of qualifiers and explanations that add up to this: you may have a birth certificate proving you were born there but there are degrees of “native” and it doesn’t do to overstep by claiming any authority over what a Mainer is or isn’t. That made me laugh and sparked a rueful sense of identification. I grew up in neighboring New Hampshire where my family has lived for nearly 50 years, a drop in the bucket that nowhere near assures us “native” status. This kind of thing will happen for any reader, though. 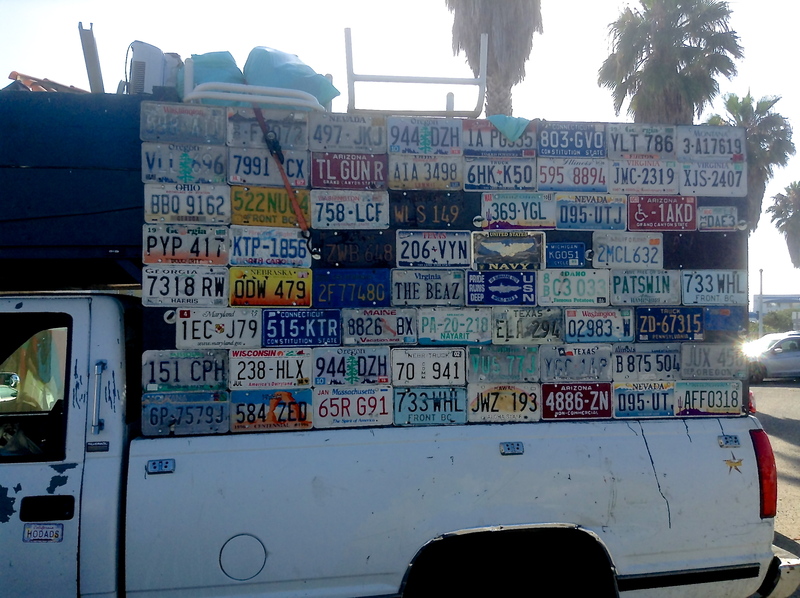 Many of us came from one of the fifty states. Others of us found our way to one or more for work, love, school, or just curiosity. Part of the fun is seeing if the essayist got “your” state right. For example, Will Blythe does a beautiful job of being a New Yorker traveling the roads of New Hampshire but, like most visitors and the swarms of media types who cover elections every four years, never ventures into the upper third of the state. He missed the heart of it. And I say this from the completely unbiased viewpoint of one who came of age there. Of course, the minute I opened the front cover and saw the definitely not-to-scale map of the country inside, I did what anyone would do: I counted how many states I had set foot in. The answer, I was happily surprised to discover, is 48. I started to read the essays about states I already felt some connection with and then I stopped, went to the beginning and went through alphabetically. You’d never plan a real road trip that way but was a wonderful way to sink into the diversity and also to find the common threads that run through the tapestry that is the country. In every case I was in the hands of a guide whose unique voice and experience left me completely satisfied, and also wanting more. I loved this book so much that I bought two used copies after I returned my library copy. I’m keeping one but would really love to share this book with another intrepid reader and traveler. If you’d like it, write a comment and let me know how many states you’ve visited, or your favorite state and why, or an adventure you had while traveling through the U.S. I’ll add your name to a list and on Tuesday, July 16, I’ll use Randomizer to pick a winner. Then I’ll get in touch to make shipping arrangements. Thanks and, selfishly, I’m looking forward to learning from all you fellow travelers. Hi Betsy! Love this blog, and remember you and Pete heading off on your adventure! There are 21 states I have NOT yet been to, and if I were to give priority, would like to visit Tennessee and Kentucky some time – the Blue Ridge Mountains, Nashville, Memphis. Thanks for the inspiration! Hi, there, I’ll be over on your page shortly to let you know that you won the drawing. I put your name “in the hat” with the other comments and all those who clicked “like” on this post and you surfaced on Randomizer as the winner. Congratulations and I’ll be sending you your copy of “State by State,” as soon as we connect. I have been in, or through, 21. That’s a lot more than I thought it would be! I had the opportunity to travel back and forth between both coasts when married to my ex-husband, as I am from Kansas, and he is from Washington State, and attended military schools in other states. Lucky me, I also got to live in Germany for 3 years, and see some of Europe. I think the US is an amazing mish-mosh of landscapes. I am quite partial to my home state even though we alternately bake and freeze here. I might like to live elsewhere for awhile, but am never quite sure where I would like to go. Thanks for sharing about the book! It sounds as though you’ve been able to sample a good bit of this country and living in Germany for three years must have been a rich experience too. Thanks for commenting on this post. I’ll be giving more books away the next few weeks so stop back by. I’m thinking that the one I’m putting up there in two weeks about two books by amazing women might offer you something you’d really appreciate. Thanks again for staying in touch. BTW, I wanted to address you by name but couldn’t find it on your blog. Feel free to share it. I think of you and check in often over there.